November 2018 www.coalage.com 23 dragline maintenance continued cost per bank cubic yard with a variety of upgrade options, while a mine with only a few years left may never receive the re- turn on investment," Casson said. "Almost every mine, however, can still reap some benefits from improved reliability and performance, even in the short term, with DC upgrade options." With modern computerized main- tenance management systems (CMMS), it is easier than ever to track direct costs of maintenance and repairs. Couple that with a study of historical data for the cause and duration of both planned and unplanned downtime, a planner can develop a very good picture of prob- lem areas to focus on and begin to seek proper solutions, Casson explained. "The cost of unplanned downtime and lost production is almost always the real cost to focus on and far outweighs the direct costs from a maintenance standpoint," Casson said. Depending on the actual upgrade performed, the downtime can vary from a few days to several weeks. "Almost all electrical upgrades, however, can be performed within a planned shutdown window established by mechanical main- tenance requirements," Casson said. "The electrical portion of a dragline shutdown is almost never the critical path for the total duration." A couple of years ago, Flanders de- veloped a new, complete dragline control platform that can be used for both AC and DC machines. The company is currently partnering with a company that operates multiple draglines to develop adaptive control technology for various portions of the dig cycle. 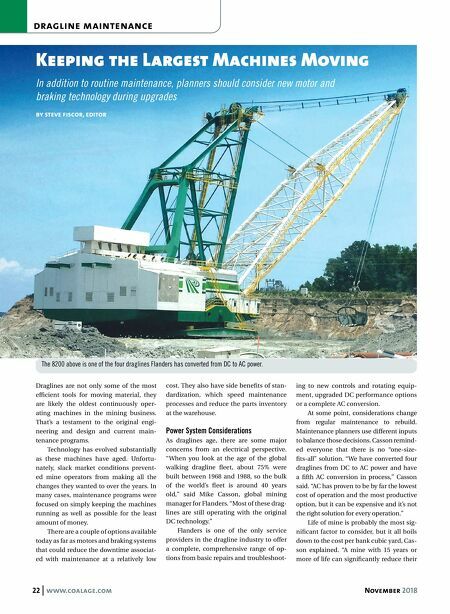 "We are very early in this development, but in cooperation with this end-user and taking a holistic approach to the dragline, we have already identified actionable opportunities to decrease cycle time significantly while still protecting the machine," Casson said. 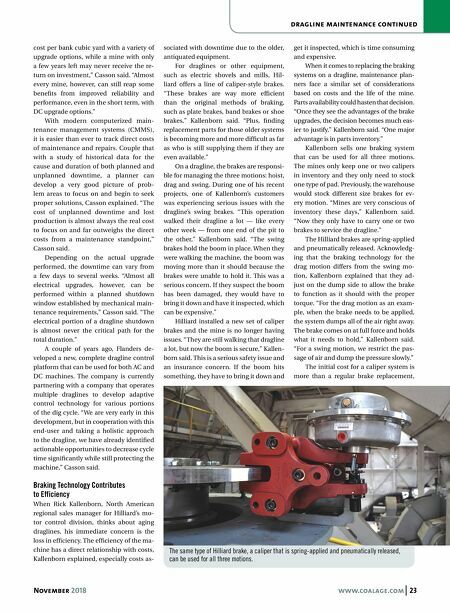 Braking Technology Contributes to Efficiency When Rick Kallenborn, North American regional sales manager for Hilliard's mo- tor control division, thinks about aging draglines, his immediate concern is the loss in efficiency. The efficiency of the ma- chine has a direct relationship with costs, Kallenborn explained, especially costs as- sociated with downtime due to the older, antiquated equipment. For draglines or other equipment, such as electric shovels and mills, Hil- liard offers a line of caliper-style brakes. "These brakes are way more efficient than the original methods of braking, such as plate brakes, band brakes or shoe brakes," Kallenborn said. "Plus, finding replacement parts for those older systems is becoming more and more difficult as far as who is still supplying them if they are even available." On a dragline, the brakes are responsi- ble for managing the three motions: hoist, drag and swing. During one of his recent projects, one of Kallenborn's customers was experiencing serious issues with the dragline's swing brakes. "This operation walked their dragline a lot — like every other week — from one end of the pit to the other," Kallenborn said. "The swing brakes hold the boom in place. When they were walking the machine, the boom was moving more than it should because the brakes were unable to hold it. This was a serious concern. If they suspect the boom has been damaged, they would have to bring it down and have it inspected, which can be expensive." Hilliard installed a new set of caliper brakes and the mine is no longer having issues. "They are still walking that dragline a lot, but now the boom is secure," Kallen- born said. This is a serious safety issue and an insurance concern. If the boom hits something, they have to bring it down and get it inspected, which is time consuming and expensive. When it comes to replacing the braking systems on a dragline, maintenance plan- ners face a similar set of considerations based on costs and the life of the mine. Parts availability could hasten that decision. "Once they see the advantages of the brake upgrades, the decision becomes much eas- ier to justify," Kallenborn said. "One major advantage is in parts inventory." Kallenborn sells one braking system that can be used for all three motions. The mines only keep one or two calipers in inventory and they only need to stock one type of pad. Previously, the warehouse would stock different size brakes for ev- ery motion. "Mines are very conscious of inventory these days," Kallenborn said. "Now they only have to carry one or two brakes to service the dragline." The Hilliard brakes are spring-applied and pneumatically released. Acknowledg- ing that the braking technology for the drag motion differs from the swing mo- tion, Kallenborn explained that they ad- just on the dump side to allow the brake to function as it should with the proper torque. "For the drag motion as an exam- ple, when the brake needs to be applied, the system dumps all of the air right away. The brake comes on at full force and holds what it needs to hold," Kallenborn said. "For a swing motion, we restrict the pas- sage of air and dump the pressure slowly." The initial cost for a caliper system is more than a regular brake replacement, The same type of Hilliard brake, a caliper that is spring-applied and pneumatically released, can be used for all three motions.